The downloadable expansion pack from RedLynx is now available for PC, PS4 and Xbox One. 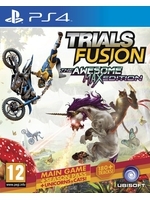 New players can also get Trials Fusion: The Awesome Max Edition, which contain the main game and all the DLCs released up until now. SAN FRANCISCO – July 15, 2015 – Today, Ubisoft released Trials Fusion: Awesome Level MAX, a downloadable expansion pack for Xbox One, PlayStation®4 computer entertainment system and Windows PC. The Awesome Level MAX is available as a standalone DLC to existing Trials Fusion players, or as part of Trials Fusion: The Awesome Max Edition, a new bundle including the main Trials Fusion game, the full Season Pass of six DLCs and the just released Awesome Level MAX DLC. Both are available to download now. Awesome Level MAX DLC introduces two immersive, new events to Trials Fusion – Awesome Adventure and RedLynx vs. All-Stars – that rely on rock-solid motocross physics and reality-bending course designs to create an over-the-top racing experience. The Awesome Level MAX pack introduces 30 all-new tracks plus 10 additional supercross tracks, a variety of new garage items, achievements, track challenges and objects for the track editor. The Awesome Adventure ups the ante on extreme motobike riding with a new array of platform-racing challenges by transforming your character into a gun-wielding cat riding a flamethrowing unicorn. The Awesome Adventure includes eight new classic Trials tracks, various mini-games and an entertaining soundtrack for the ride. The RedLynx vs. All-Stars content reflects the team’s committment to supporting the active community of track-builders and the desire to continue increasing the uniqueness of the Trials experience by regularly adding eccentric, new levels. The pack pits RedLynx’s own track creators against the top track creators in the Trials community from across the world. RedLynx vs. All-Stars includes a collection of more than 20 all-new tracks. For a second there I thought I was seeing blinx.